Hyderabad capital city of the Indian state of Andhra Pradesh. Situated in the region of Andhra Pradesh, the city has an estimated population of 6.8 million,making it the 5th most populous metropolis in India. 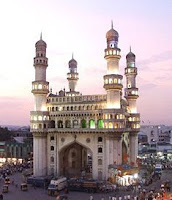 Hyderabad is known for its rich history, culture and architecture representing its unique character as a meeting point for North and South India, and its multilingual culture, both geographically and culturally. Hyderabad is also one of the most developed cities in the country. It is now a hub of information technology, ITES (BPO) and biotechnology. The city is also known for its ancient cuisine which is famous all over India. Double is like a big bu. Hyderabadi's eat it with chicken curry etc during meals. 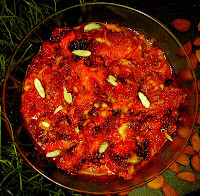 This is a special dish which is prepared with double for all festivals and when the sweet tooth demands. Try it! Its easy and tasty too.